The Shanghai Composite was up nearly six percent on the day. But those who invested midway through June are still nursing losses of some thirty percent. Losses are likely to be further compounded because of the widespread use of margin trading among the country’s numerous retail investors. The crash, which was triggered by a change in rules on margin levels, erased three trillion dollars from the value of equities. The fear now is that these losses, suffered mostly by the emerging middle classes, will bite into Chinese growth which was already suffering a major contraction. Today’s figures on Chinese inflation were slightly better than forecasts. The consumer prices index rose by an annual 1.4% in June. Producer prices remain under pressure and underwent an annual fall of 4.8%. This was even worse than the 4.5% drop expected. As expected, commodity currencies have been the main casualties from the retreat in Chinese markets. AUD/USD made a minor gain today following three days of falls. At 0.7434 the rate remains at a six year floor. This came thanks to some strong employment data. The unemployment rate fell unexpectedly to 6.0%. The labor participation rate also improved last month. 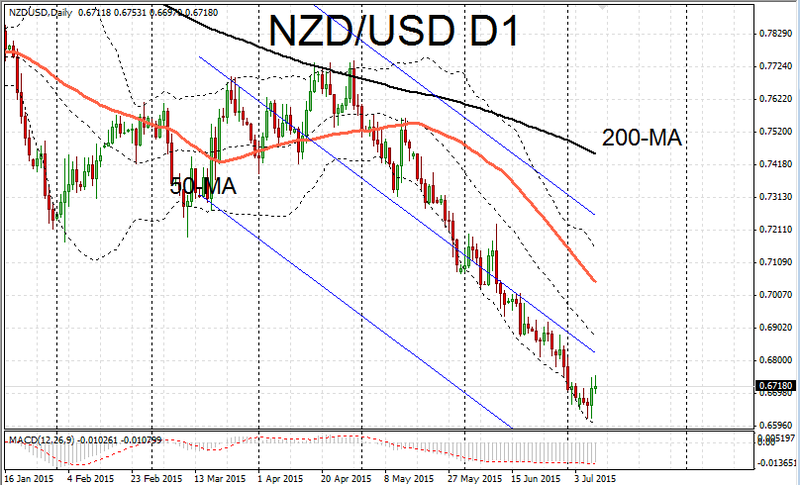 The New Zealand dollar is considerably oversold and this has helped NZD/USD attempt a minor recovery. 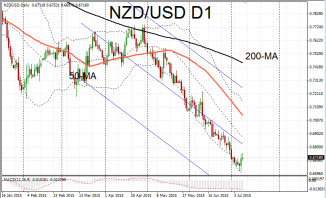 NZD/USD gained for a second day rising to 0.6721. The hourly chart has shown some positive signals but resistance around 0.6753 is a barrier.